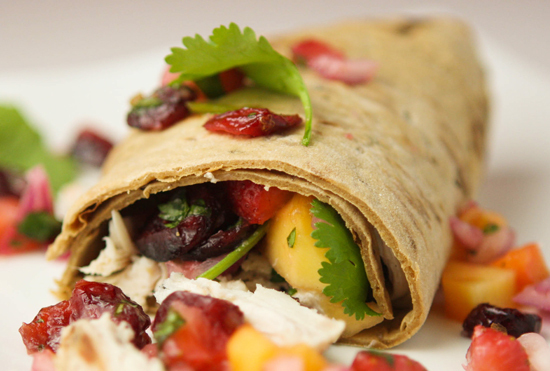 Coconut Grilled Chicken with Mango Salsa Recipe — Pip and Ebby - easy, delicious recipes! Let the sweetness of the coconut oil mix in with the spiciness of the jalapenos with a fresh lime juice to cut the heat for an amazing combination to cover the chicken breasts. This Mango Salsa can top ANYTHING and make me swoon! Unless you, too, frequently drive along Viking Drive in the city in which I work, you might not believe me when I say that there is still a 10-foot pile of dirty snow that sits on the ground across the street from my place of employment. Every time I see that disgusting pile of slop, I let out a defeated sigh and instantly start dreaming of a tropical vacation. My husband and I started planning a tropical vacation a few months back, right after we learned that our oldest son would need to have his next surgery sooner than we expected. We weren't able to find childcare, though, so our tropical vacation never transpired. And I find myself sadly dwelling on that missed opportunity a lot these days. So I have found that I have to do little things to trick myself into thinking that I'm sitting on a beach, enjoying my husband's company in WARMTH and with no large piles of snow in sight. When Kelapo contacted me and asked me to try their coconut oil, I knew it was meant to be. Coconuts = beaches = sunshine = no snow. Can I tell a quick story? Five years ago when my wonderful husband and I were on our honeymoon in Nassau, Bahamas, lying on the beach, absorbing the hot sunshine, we listened to a beach vendor repeat, "Fresh COCONUTS, tropical DRINKS, this is not a CEMETERY, let's get the pah-ty STAH-TED!" Over and over and over. But we didn't mind the repetition because, well, we were in the Bahamas. And he was talking about drinks and parties, and oohhhhh, I hate that stupid pile of snow. I often wonder if it will be July when it finally disappears. Coconut is a wonderful oil that offers flavor and great benefits to using in your meals. Coconut oil liquifies when it’s warmer than 75 degrees otherwise its a semi-soft oil you can scoop out with a spoon. Coconut oil is a very stable oil and can withstand high temperatures to prepare your meal. Enjoy! If I can’t find a good mango or don’t like mangos, can I use another salsa? Yes, mango salsa offers the sweet and the spicy together in one lovely bite. But you aren’t limited to this flavor! Try substituting pineapple. You could also buy a jar of salsa in a pinch with any fruit added. 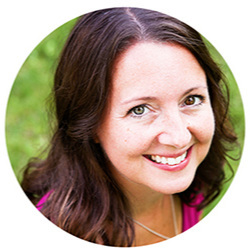 The first thing that came to my mind when concocting a coconut-oil-related recipe was a light, fresh, fruity, delicious chicken meal that would make me think of a tropical vacation. First, though, I'd like to tell you how delicious coconut oil is. It can be such a great replacement for olive oil in a variety of dishes. I highly recommend it, and especially the Kelapo brand, which is now available in the Minneapolis area at Lunds and Byerly's. There are nutritious benefits to consuming coconut oil, as well. Check out Kelapo's website for details. I wanted to create a sweet-spicy marinade for the chicken. My goal was to keep it simple because what I had in mind for the salsa was a little bit more complicated. Place 4 chicken breast halves in a shallow dish and cover with the coconut oil-jalapeño mixture. Cover and let sit in the refrigerator overnight, turning the chicken occasionally. Discard the large chunks from the dish and grill the chicken over medium heat until meat is no longer pink, about 15-18 minutes. By the way, I used these delicious Orange Flavored Cranberries from Trader Joe's, and I loved the citrus flavor they added. Yum. Yum. Yum. TJ's rocks. Spoon the salsa over top the grilled chicken. Close your eyes and pretend you are near the ocean. Someone in the distance is talking about fresh tropical drinks. I have to say, this is a fabulous little meal. I love the underlying coconut flavor that peeks through, mixed in with the assortment of other light flavors that danced around inside my mouth. The next day for lunch, I shredded the chicken and put it atop a piece of flatbread. I topped it with the mango salsa and a little extra fresh cilantro. It was a delightful lunch, once again bringing me back to an imaginary tropical location. And making me forget about that wretched pile of snow. This mango salsa can top ANYTHING and make me swoon! 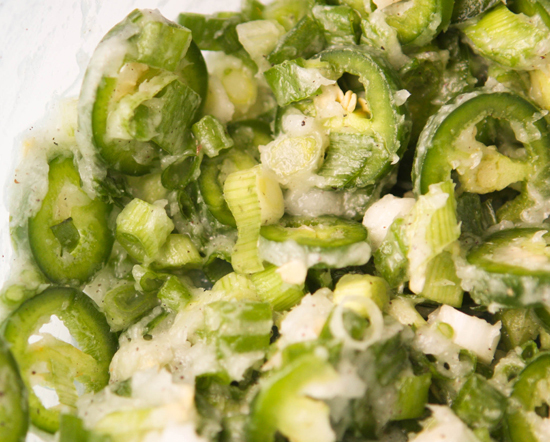 In a medium bowl, combine the jalapenos, green onions, juice for 1 lime, 2 tablespoons coconut oil and salt and pepper. Place chicken in a shallow dish and cover with the coconut oil-jalapeno mixture. Cover and let sit in the refrigerator overnight, turning the chicken occassionally. Discard large chunks from dish and grill chicken over medium heat until meat is no longer pink, about 15-18 minutes. 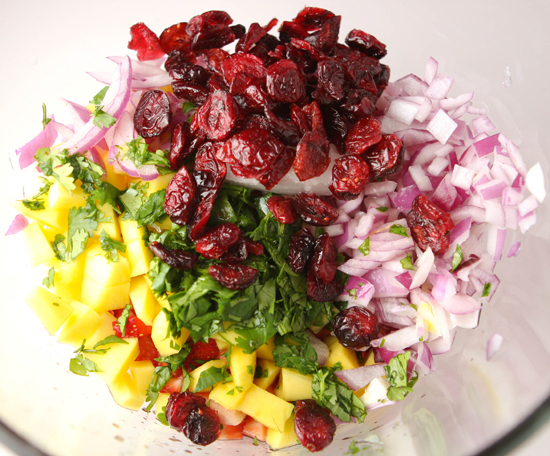 In a medium bowl, combine mango, strawberries,cranberries, juice from 1/2 a lime, red onion, cilantro, red wine vinegar, 2 tablespoons coconut oil and salt and pepper. Spoon mango salsa over grilled chicken and serve.